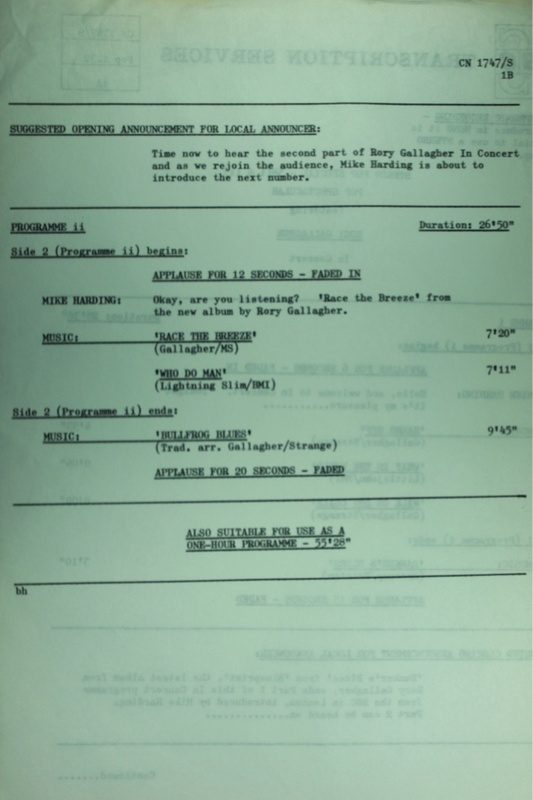 - 12 Aug 1971, 13 Jan 1972, and 13 Jul 1972 (three separate concerts):Paris Theatre, Lower Regent Street, London. None of the above were on the BBC CD, but these were ... ??? Taste: August 5, 1968 (Tx. 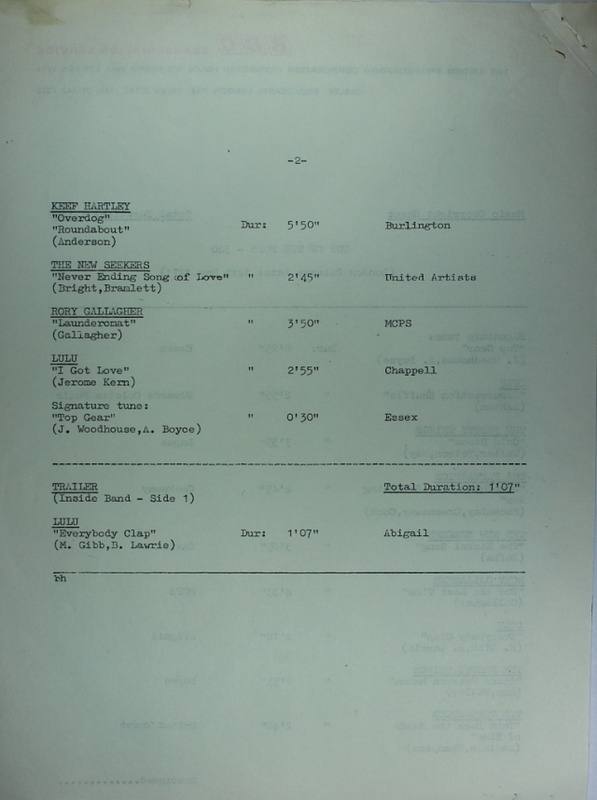 8-25-68) BBC Top Gear Studio Session; London, Eng. Taste; October 3, 1968 (Tx. 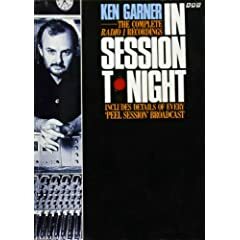 10-30-68) BBC Night Ride Studio Session; London, Eng. Taste; October 25, 1968 (Tx. 11-12-68) BBC WS R&B Studio Session; London, Eng. 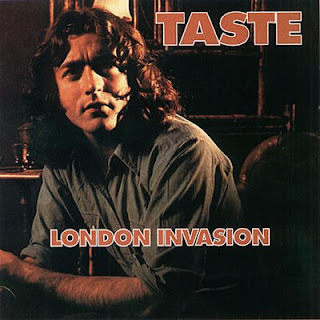 Taste; October 25, 1968 (live) Marquee, London, Eng. Taste; February 17, 1969 (Tx. 3-9-69) BBC Top Gear Studio Session; London, Eng. Taste; February 19, 1969 (Tx. 3-10-69) BBC WS R&B Studio Session; London, Eng. Taste; July 8, 1969 (Tx. 7-13-69) BBC Symonds On Sunday Studio Session; London, Eng. Taste; October 29, 1969 (Tx. 11-22-69) BBC WS R&B Studio Session; London, Eng. Taste; April 2, 1970 (Tx. 4-12-70) (live) BBC John Peel "In Concert"; Paris Theatre, London, Eng. Taste; April 15, 1970 (Tx. 5-10-70) BBC Raven's R&B Studio Session; London, Eng. Taste; June 16, 1970 (Tx. 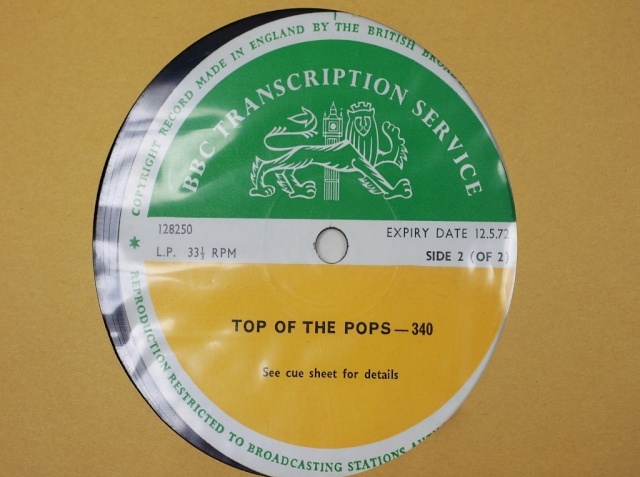 6-23-70) BBC Harding Show; Studio Session; London, Eng. Rory; April 15, 1971 (Tx. 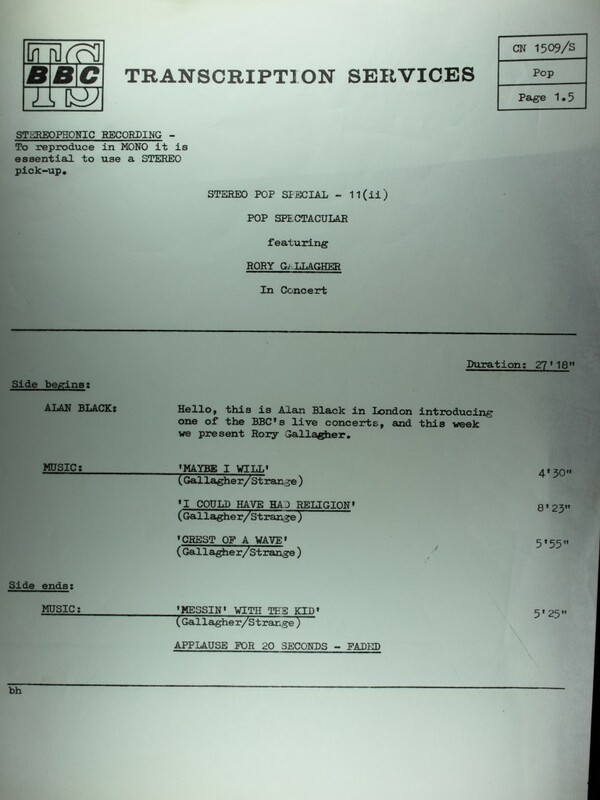 5-14-71) BBC Black Show; Studio Session; London, Eng. 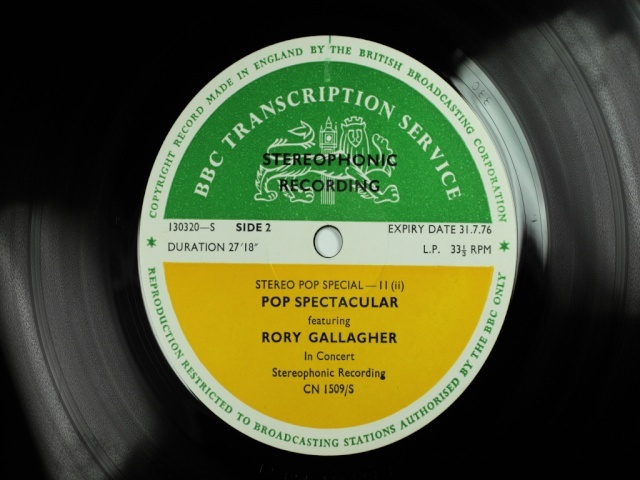 Rory; July 19, 1971 (Tx. 7-27-71) BBC Harding Show; Studio Session; London, Eng. Rory; July 21, 1971 (Tx. 7-31-71) BBC Raven's R&B Studio Session; London, Eng. Rory; August 12, 1971 (Tx. 8-22-71) (live) BBC John Peel Sunday Concert; 1st In Concert; Paris Theatre, London, Eng. Rory; November 24, 1971 (Tx. 12-21-71) BBC Drummond Show, Studio Session; London, Eng. Rory; January 13, 1972 (Tx. 1-22-72) (live) BBC "2nd In Concert"; Paris Theatre, London, Eng. Previously had this for 1-13-72 (Tx. 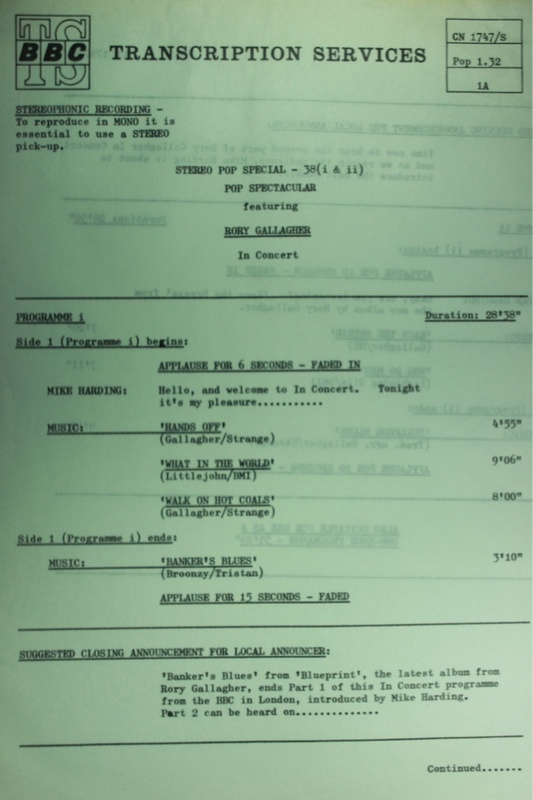 1-22-72) BBC 2nd In Concert; London, Eng. Rory; June 2, 1972 (Tx. 6-15-72) BBC Drummond Show, Studio Session; London, Eng. Rory; July 10, 1972 (Tx. 8-7-72) BBC Bob Harris Show, Studio Session; London, Eng. Rory; July 13, 1972 (Tx. 7-29-72: aka 10-15-72) (live) BBC "3rd In Concert"; London, Eng. 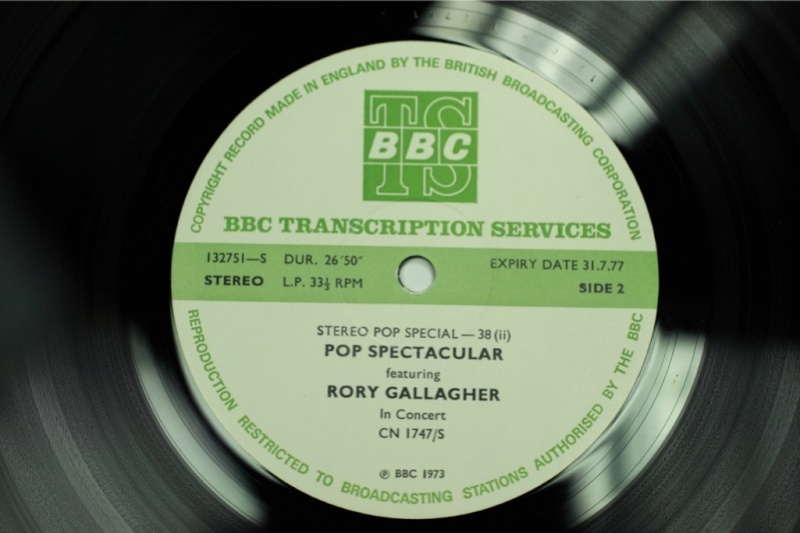 Rory; February 1, 1973 (Tx. 2-10-73) (live) BBC "4th In Concert"; Hippodrome, London, Eng. 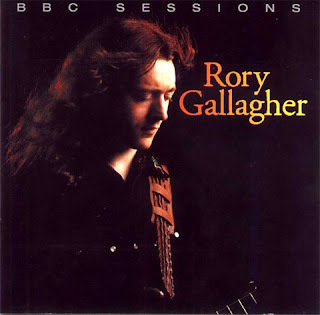 Rory; February 5, 1973 (Tx. 2-8-73; aka Jan/Feb '73) BBC John Peel Show, Studio Session; London, Eng. Rory; February 21, 1973 (Tx. 2-26-73) BBC Harris Saturday Rock Show Studio Session; London, Eng. 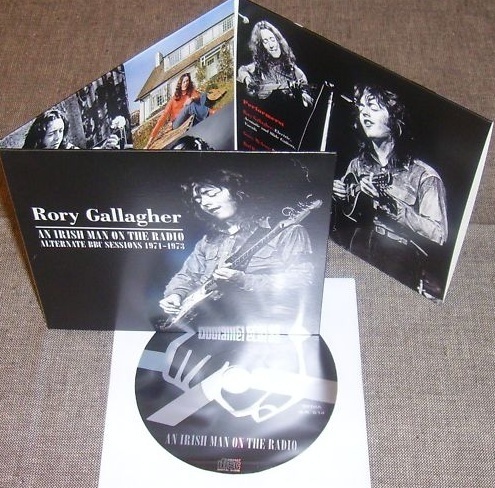 Rory; December 5, 1973 (TX. 12-15-73 Rock On Show, & Tx. 7-1-74 Harris Show) BBC Saturday Rock Show, Studio Session; London, Eng. Rory; June 19, 1974 (Tx. 7-22-74) BBC Studio Session, London, Eng. Rory; June 20, 1974 (Tx. 6-29-74; aka 4-14-74) (live) BBC "5th In Concert"; London, Eng. 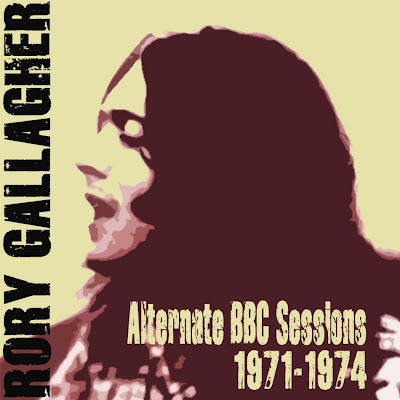 Rory; January 19, 1977 (live) BBC Sights & Sounds; "6th In Concert"; Hammersmith Odeon, London, Eng. Rory; January 20, 1977 (Tx. & aka 6-4-77) (live) BBC Golders Green; "7th In Concert"; Hippodrome, London, Eng. 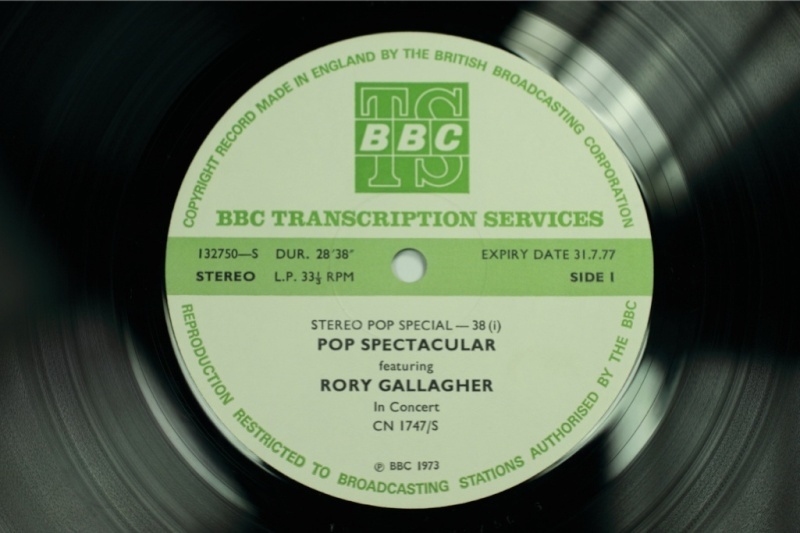 Rory; August 19, 1977 BBC Capitol Radio; Hammersmith, London, Eng. Note: Does the official release have the correct date for these?????? (Country Mile .... released) ????????????? (Got My Mojo Working .... released) ??????????? (Used To Be .... released) ??????????? 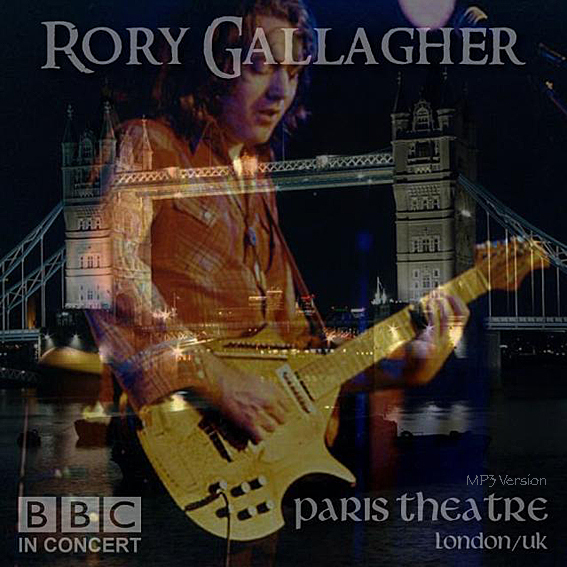 Rory; September 20, 1979 (aired?/aka 7/5/80) The Venue, London, Eng. Oh que oui, une compile excellente, voire indispensable! Quand je vous disais que Tonton avait un oeil bionique! Le morceau "I Fall Apart" est présent sur quel album ou bootleg des BBC Sessions ? J'ai l'album officiel mais il n'est pas dessus malheureusement.